HY-TECH ceramic insulating paint additive is a fine, white powder blend of high strength ceramic "microspheres". Each single ceramic microsphere is so small that it looks to the naked eye as if it is a single grain of flour, (slightly thicker than a human hair). When mixed into paint the painted surface dries to a tightly packed layer of the hard, hollow "microspheres", (Hy-Tech's exclusive CVM, ceramic vacuum matrix technology.) The tightly packed film reflects and dissipates heat by minimizing the path for the transfer of heat. The ceramics are able to reflect, refract and block heat radiation (loss or gain) and dissipate heat rapidly preventing heat transfer through the coating with as much as 90% of solar infrared rays and 85% of ultra violet-rays being radiated back into the atmosphere. 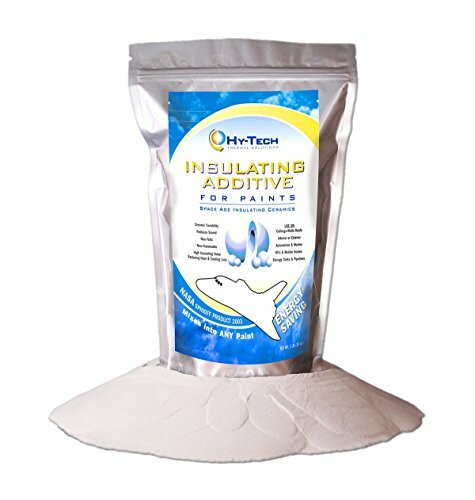 Hy-Tech insulating additive is completely inert and can be mixed into ANY paint, coating or composite including interior house paint, exterior house paint, roof paint, solvent base coating, epoxy, urethane, high temperature paint, elastomerics, mastics etc. The addition of the ceramics to any material provides improved fire resistance, protection of coated surfaces from harmful UV rays, repulsion of chewing insects and increased durability of the coating due to the hard ceramic finish. Ceramic filled paint is easier to clean and lasts far longer than conventional paint pigments. Reduces heat and cooling loss! If you have any questions about this product by Hy-Tech Thermal Solutions, contact us by completing and submitting the form below. If you are looking for a specif part number, please include it with your message.